Do you love to DIY or to upcycle things into one-of-a-kind treasures? Our Decatur ReStore is the perfect place to shop! Take advantage of deeply discounted prices on building materials, tools, furniture and household items to decorate or renovate your home at a fraction of the cost and you’re helping further our mission at the same time! Our mission at the Decatur Habitat ReStore is to give a new life to great merchandise and to provide a new start for deserving families by creating the necessary funds to supply and build Habitat homes in Morgan County. We receive new donations daily. You never know when you might uncover your next great find! Follow us on Facebook and stop by the ReStore often to see what’s new. Your donations to the ReStore helps fund the mission of Habitat. Are you remodeling, moving, or downsizing? You can transform your unwanted furniture, appliances, cabinets, and tools into merchandise to fund Morgan County Habitat’s homes and homeowner programs. To schedule the free ReStore pick-up service, simply call 256- 308-1160 or use our convenient online pickup request form. NOTE: The Habitat ReStore has the right to refuse any donation for any reason. The items you donate to ReStore help provide almost 90% percent of the funding that goes to building homes. From kitchen cabinets to antique dressers and dinner plates to table saws you can transform your unwanted tools, fixtures and furniture into merchandise to fund Morgan County Habitat’s homes and homeowner education programs. To schedule the free ReStore pick-up service, simply call 256- 308-1160 or use our convenient online pickup request form. NOTE: The Habitat ReStore has the right to refuse any donation for any reason. A wide range of home building and improvement materials is offered for sale at the ReStore from hinges, knobs and hardware to furniture, cabinets and lighting. The list of items you may find is long, including appliances, household goods, books, and knickknacks. We sell these items at 50-70% less than retail. 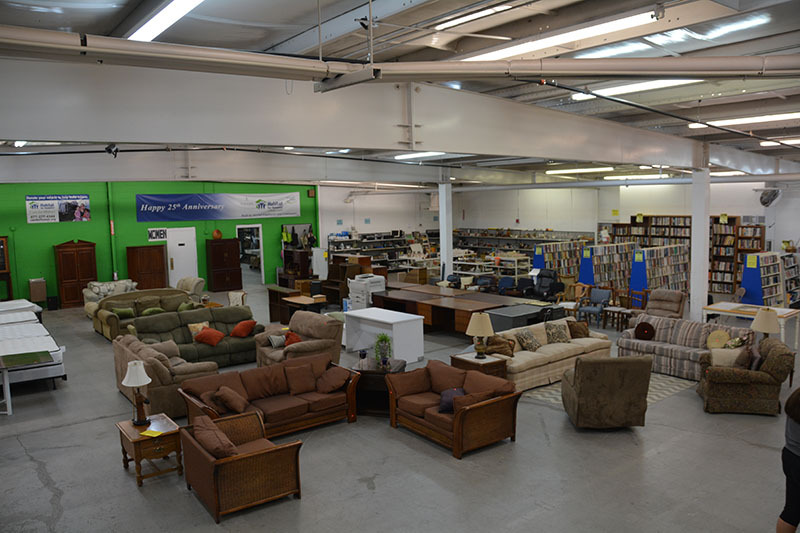 The ReStore accepts new and used building materials and other items in good usable condition. We sell these items at 50-70% less than retail. We have furniture of all styles and sizes – from modern to antique. We have rocking chairs, reclining chairs, office chairs, folding chairs, dining chairs and of course, easy chairs. We carry sofas, loveseats and we also carry living room and dining room suites. You’ll find desks, cabinets, mirrors, dressers, and tables. Stop in and check often because we get new items in daily. Come check out our choice of lighting! We have fixtures for every room in your home: living room, kitchen, bedroom, bath, lamps and even outdoor lighting. We carry a wide range of appliances from refrigerators to microwave ovens, including stove hoods, washers, and dryers. The appliances move fast so make sure to check with us often! We have cabinets for your kitchen, bath and garage. We carry single-door and double-door either with or without drawers. We have vanities for your bath or freestanding cabinets for your work area. We also have a large selection of new cabinet doors. We have used doors, windows and trim to help with your remodeling or repair jobs. We carry tile, laminate flooring and carpet squares for your flooring needs. Check out our large selection of doors and windows for your remodeling jobs. There is also trim to finish off the edges as well as paint and stain. Come check out our knickknack area. It’s an upcycler’s playground. We have figurines, candles, candleholders, dishes, shelves, picture, picture frames and much more. We also have books and magazines for next to nothing. Hardware to finish the job right! We carry many choices for cabinet knobs and hinges, door hinges, switch plates and outlet covers that put the perfect finishing touches on your project. We are a non-profit home improvement store, open to the public. We sell surplus new and used building and home improvement materials to the general public at 50% - 70% off retail pricing. The supply of materials sold in the store comes through donations by private citizens, contractors, and local home supply businesses. These materials can be remnants from building projects, overstocks, slightly damaged new merchandise, or any other building or home improvement materials that would otherwise end up in the landfill. In observance of Good Friday the ReStore will be closed April 19, 2019. We will re-open Saturday April 20,2019 at 9am to 4pm. SPRING CLEANING? Think of Habitat restore, we will pick up your gently used items, if you are already coming to town drop by and give us your donations. This couch could be your's for only $55.00. Come in and check it out. We have received some dressers. The chest of drawers $45.00, the two shorter ones are $55.00 each. Your contributions of goods and materials are welcome . . . and needed. When you donate or shop with us, you are helping build a Habitat home. Pick up of items is available. Check out the full list of items we can and cannot accept. General Worker: If you love to stay busy and take on a variety of tasks, we want you! From taking donations to unloading them at our ReStore, your hands help us bring our new items into the store for purchase. You will interact with customers, help keep the store running, and see the full scope of operations at the ReStore. Please be aware that heavy lifting might be involved in this position. Truck Assistant: This job is one of the most important roles at Morgan County Habitat! From picking up donations to unloading them at the store, your help in moving merchandise keeps the ReStore stocked and supports our future Habitat homeowners. Heaving lifting will likely play a role in this volunteer position. Merchandiser: Have a knack for using your artistic side? Help us best display our new donations and show our customers just what the ReStore has to offer! Brainstormer: We are always searching for innovative minds to help us with marketing, fund-raising, and special event creation. From Pinterest days to social media programming, we want your ideas! Construction Educators: If you have a background as an electrician, plumber, or HVAC technician, come share your knowledge with our staff and teach monthly workshops on the basics of these crucial build skills. All shifts are scheduled for four-hour blocks during our business hours, which are listed below. Saturday 9:00 A.M. – 4: 00 P.M. If you would like to spend time with us at the Habitat ReStore, please register as a volunteer online or contact Volunteer Coordinator Landis Griffin at 256-340-9609, ext. 222.